I was reading FB this morning and saw a humorous post. Someone had posted a pic of a toddler in an orange jumpsuit facing another crying toddler. 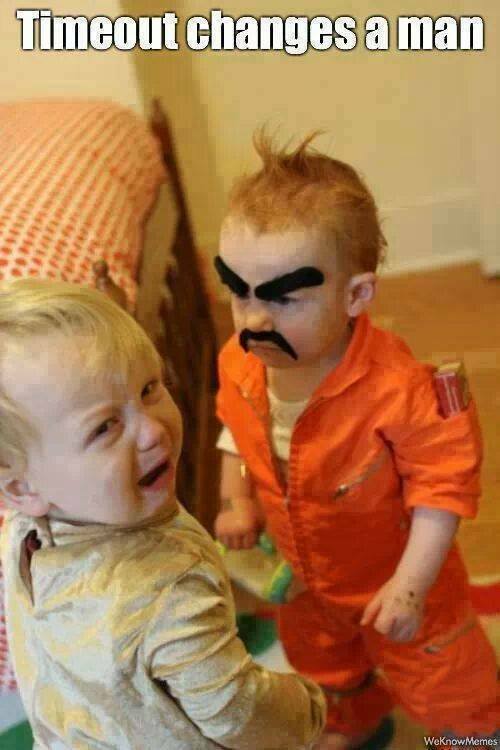 They'd marked-up the picture to make the "prison baby" look angry, and the picture was captioned: "Timeout changes a man." I marveled how an attempt at humor often reveals deeper truths, like drawing an uncomfortable analogy to punitive parenting methods. I saw another picture, where one of my friends had posted a typical Christmas shot of herself and her adult children. There was nothing embarrassing, unduly personal, or wrong in the picture that I could detect, but one of the kids had commented something along the lines of: "I said no posting of this on Facebook. Reported." I'm not sure whether she was joking or not. The comment was deleted when I looked a second time, and the picture was still there. Knowing both of these women, and the daughter a little less well, in her childhood, I know that there has been periodic tension there, but also off-the-wall, or tin-eared humor, so I couldn't be sure, but still. I found it interesting in the way I see things now. There are things about that dynamic to which I would have been blind, at the start of this year. I suspect that the daughter felt her privacy was invaded and her wishes not respected. I think the mother has a tendency to write-off her daughter's concerns as "drama," or passive aggression, and maybe it is, but still...the daughter perhaps feels like she is not respected and the mother has before said some things to this particular kid that I thought were probably a lot less than helpful and positive. I even saw that dynamic at work before I started learning about what makes these kinds of dysfunction happen. I see insecurities from both sides in that relationship and the lack of understanding in how to negotiate effectively. I'm not claiming any particular expertise in that area myself, and far from it, but given the things I've been working on improving lately, I've come to recognize certain patterns such that I can see better when the negotiating process is not working. I can sympathize with the daughter. The mom does have a few traits that contribute to less than positive outcomes when certain needs of hers are not being addressed, and she handles them in ways my own mother did, to a certain extent. This is the "holiday stuff" that people take for granted, or normalize, and even if it only comes out at certain times, it does reveal areas where we could be more effective human beings when dealing with each other. I was speaking to my parents on the phone this morning. They had sent me some money for my daughters and to get some presents for the girls from them. We were talking about what they liked and what I thought might be good ideas when they started bickering with each other. As distressing as it is to see, it is still interesting and educational to watch the dynamic between them at work. They are neither one stupid people. It's not like they don't understand anything about how to negotiate with other human beings. Why do we have so much trouble with the people with whom we have the supposedly most important connections? Why are their interactions so often blighted by poor attempts at control and manipulation and retaliation? They're both very wounded people, and they've been periodically treating each other poorly all of my life, especially around holidays. I know that I cannot play therapist for them, nor am I remotely tempted to try, having absolutely no idea where to begin even if I thought that was a good idea. I don't even know how to broach the subject of them possibly talking to someone else, either, without getting them all stressed and making things worse. It's sad, and it hurts. I am becoming more and more aware of the nature of the mess it is for me. I've seen these kinds of things play out in my own marriage and in other interactions. It is grotesque. The hardest thing to accept is that it is so senseless. It doesn't have to be. I'm finding out that there are things that can be done that can improve your ability to live better and more consciously. It just takes curiosity to find things out and acquire new information and the will to confront oneself and examine honestly and commit to implementing better practices. It is so tempting to eat the lotus blossoms though, and shut down our conscious minds and allow them to drift at the mercy of the winds and waves of the oceans that are our subconscious selves, that is, when we even realize what it is we are doing when we do it! The wheel is there. It is for the captain to take the helm or the ship is lost.